In an increasingly IoT-connected world, Smart Energy and Smart Transportation are tightly linked. In fact, Smart Transportation isn’t possible without a Smart Energy component. “Smart” transportation has begun to imply “electrified” transportation: the move to battery-operated cars, trucks, motorcycles and soon other forms is well underway, with commercial trucking already adopting autonomous driving and on the verge of going mainstream. In fact, self-driving vehicles have to be electric because traditional internal combustion engine vehicles cannot refuel themselves at today’s gas stations, but an electric vehicle (EV) can drive itself to a recharging station, much like household robotic vacuum cleaners. Okay, gasoline powered vehicles can make their way to full-service gas stations, but those are very few and far between – in the USA, they are mainly in Oregon and New Jersey, and only in counties with more than 40,000 people. Very soon, a self-driving EV will be able to make its way to a parking spot equipped with wireless chargers embedded in the pavement. Directional induction charging is fast becoming a reality; wireless inductive chargers (up to Level 2) are now commercially available. Innovation in new technologies and business models in autonomous transportation and managing electricity better is accelerating. Energy utilities are actively studying EVs and their impact on the grid. Utilities see large scale adoption of EVs as a positive thing, as they help grow demand for the electricity and associated services they can provide. Many are investing in charging-related infrastructure. Some are leading the world in sustainability efforts: Xcel Energy (a large energy utility that provides energy and related services to eight US states) recently announced they will procure ALL their energy from carbon-free sources by 2050. A number of municipalities in the US are updating their fleet vehicles to EVs. And it’s not limited to road vehicles: there is growing usage of battery-operated drones for autonomous inspections. Some utilities are using drones to capture videos and images of their power transmission lines, checking on the health of their often remotely located assets. Drones have advantages over trucks, helicopters, or fixed-wing aircraft, they provide improved safety for workers, greater efficiencies, and flights that are less intrusive to communities. Xcel Energy recently became the first in the USA to get Federal Aviation Administration approval to fly drones beyond line of sight, an important distinction for adoption of the technology and a progressive move towards improving safety while lowering Operations and Maintenance (O&M) costs. Figure 2: Inspections using autonomous drones. For more autonomy, the drones are battery-based, for similar reasons mentioned earlier. Multiple other technologies are also involved, such as automatic image processing to check for defects from the images taken by the camera-equipped drones, such as overheated transformers or vegetation encroachment on/near power equipment. That needs Machine Learning, data science and data analytics expertise. It’s also important to have options to efficiently and easily manage multiple fleets of drones, perhaps from different vendors. Drone fleet management is an emerging field and is similar in many aspects to traditional fleet management: both have to report on their current location, vehicle status, current operational status, state of key parameters, etc. The practical solution to managing a diverse set of assets is the one that nails the key performance indicators (KPIs) required to achieve the stated business outcome. On the most basic level, it must be determined which parameters are most important to report back from a drone and when. Some examples are battery status and memory card capacity. Other KPIs are more complicated: flight plans, current flight vectors, geo-fencing, altitude and geo-spatial mapping, for instance. It’s also important to know in advance if edge processing will be required. Do drones need to be able to analyze, say, an overheating transformer and send a repair alert immediately? To address and report on the KPIs, fleet managers must have – or team with vendors that have – expertise in IT and communications infrastructure and an ability to work with existing information systems. If an immediate alert is necessary, it’s important to know the best and most cost-effective way to transmit the alert – cellular data for streaming and connectivity issues need to be considered. Alerts may need to route through the utility’s existing field service automation systems. If the latency involved in routing the alert isn’t critical, the data can be offloaded inexpensively (such as via Wi-Fi at the docking station) and analyzed offline. The rollout of 5G networks is sure to have a big impact on telemetry, as it promises to improve cellular connectivity more economically and at faster speeds, leading to greater efficiencies. The advent of 5G highlights the fact that feature migration, such as for LiDAR (Light Detection and Ranging) or infra-red cameras that can make drones more useful and cost-effective, needs to be planned for. Beyond data gathering and transmission, data storage, security and retention (as required by regulatory bodies) must also be considered. The Optimise Prime project brings together smart energy, fleet management and smart transportation companies to test and implement a large-scale EV rollout for commercial enterprises in the UK. The project also studies methods for mitigating the impact on the electrical grid from mass EV adoption through deep domain knowledge, data analytics, and a wide understanding of related economics. These include parameters like fuel prices, weather forecasts, electricity supply and demand, peak and off-peak electricity rates and potential tariff changes – all while considering historical and future demand, weather trends, predicted versus actual energy supply and loads and more, all through IoT-enabled automation. The anticipated impact of the project will be remarkable: the accelerated adoption of commercial EVs in the UK will save 2.7M tons of CO2, equivalent to London's entire bus fleet running for four years or a full Boeing 747-400 traveling around the world 1,484 times! The flexibility provided by the project will also free up enough capacity on the electricity network to supply a million homes. 1. Infrastructure Everywhere. In a few years, infrastructure will improve and emerge in places we haven’t yet imagined, and the need for more insightful, more inclusive, faster data analytics will explode. For example, we will have wireless chargers embedded in the road, much like the induction loops embedded today that monitor traffic lights. These could deliver high-throughput Level 3 electricity delivery via induction charging while EVs wait at a stop light. Many electric buses today get a range boost through overhead chargers at specially built bus stops along a route. 2. Energy Storage Everywhere. Battery energy and power capacity, along with their charge-discharge cycles and quality, will improve, get safer and cheaper. To mitigate the effects of peak loads by chargers spread out in a region, grid-connected chargers will be installed with built-in battery-based energy storage; intelligent software will determine which source to use, based on economics. 3. Better Batteries. Battery sizes will shrink, while their energy density will rise thanks to continuous technological advances in material sciences. Solar panels will soon come with built-in Li-ion battery energy storage. Despite many types, Li-ion will win due to sheer economies of installed scale, enabling lower costs and further mass adoption. 4. Data-driven Driving. Data about and from self-driving EVs will be analyzed faster and in more ways, along with their routes and drive cycles. Individual components inside a self-driving EV will talk to each other and adjust dynamically – such as smart suspensions in a vehicle accommodating for roll based on dynamic conditions. 5. Streamlined Charging. EV chargers at destinations will get ready for the incoming user and auto-reserve, based on the EV’s battery type and capacity – and the EVs will communicate to each other directly and more efficiently. No more mass angry emails regarding reserved charging spots sent to corporate EV user groups! 6. Using EVs to Offset Peak Demand. Solar-roof car ports will have EV chargers and energy storage built in them to allow free charging during the day when electricity production outpaces demand. 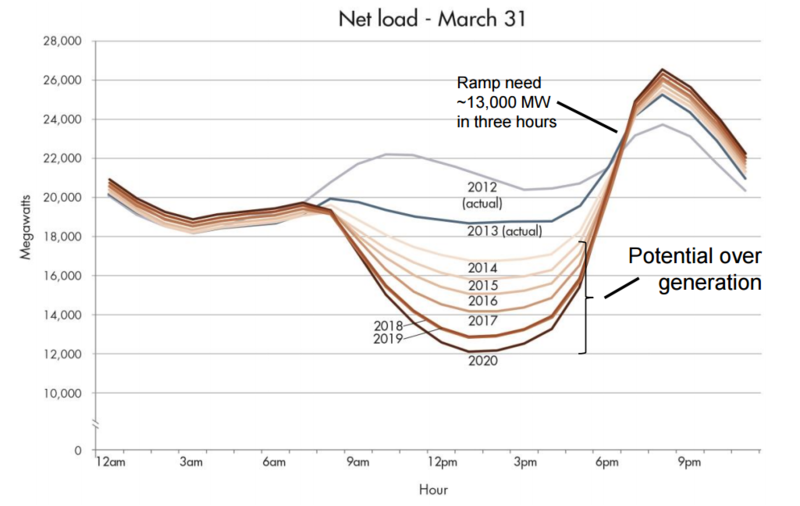 This would enable EVs to return home semi-charged, allowing them to pump “free” energy back into the building during the “duck curve” hours, which is an increase in demand between 4:00pm to 9:00pm as people return home from work. 7. Intelligently Distributed Power. Most renewable energy production will be distributed. Unlike today, where energy is produced in a centralized plant, a distributed model produces electricity where it is being consumed, avoiding losses and inefficiencies related to wheeling power. The distributed-energy-fed grid will adapt dynamically and proactively to increasingly localized demand, maybe even on a block-by-block basis. Serious progress towards making our world sustainable will require major changes and strong commitments from leaders in business and government. As the number of EVs grow, the grid will have to evolve and adapt. Road design, parking, signage, and city infrastructure will need to change – progressive, forward thinking policies will be needed from government. The arrival of 5G will allow for faster, less expensive data transmission and more efficient information extraction. The world needs many more innovative projects like Optimise Prime, a great example of what’s possible when policy, commerce and technology merges to systematically move us towards a better world. There is growing evidence that this progress is happening faster than before. Projects like these are a harbinger of a worldwide, irreversible change. The future is open to suggestions. The future is electric!